If you Google “How to become a professional pilot”, you’ll get thousands of results. There are numerous programs available to offer training for the airlines and numerous opportunities available in the middle Tennessee area. The airlines want qualified applicants, and it doesn’t matter if the applicant’s initial training was in a Part 61 or Part 141 environment. 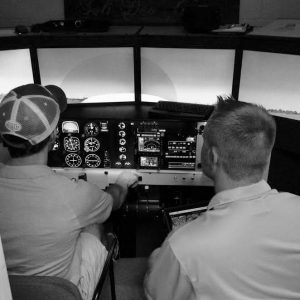 Nashville Flight Training has been training professional pilots for almost 8 years and typically saves students $30,000-50,000 for the same certificate and ratings as the big university programs or flight training academies. The economics are in your favor. Not only do we offer the training, but we offer networking opportunities for job placement that will assist students in their time building goals as well as interview opportunities with regional airlines. If a student is looking for an advanced degree as part of their Professional Pilot education, Nashville Flight Training offers a partnership with Embry-Riddle Aeronautical University Worldwide. Degree offerings include Associates, Bachelors, Masters and Doctorate levels. Students who complete the ERAU program often are hired for a higher salary and typically upgrade to captain much faster than average. Contact our office to discuss dual enrollment opportunities. See our page, Work at NFT, for more information on becoming a CFI and building your logged time. Portions of this article attributed to the Aircraft Owners and Pilots association.